So here is the situation; during the final round of the Safeway Open at the Silverado Resort, California, on the on the par-4 12th hole, Tony Finau (USA), played a difficult shot from a buried lie in a greenside bunker. His ball raced across the putting green and collided with the stationary ball of Jason Kokrak (USA), who had previously pitched up close to the hole from over 30 yards away. Finau’s ball was stopped just two feet from the hole, whereas it definitely would have travelled several feet past, perhaps as much as 30 feet, if Kokrak had previously marked and lifted his ball. The incident can be viewed at this link. Was this favourable deflection off a fellow competitor’s ball a fortunate ‘rub of the green’, or as many are claiming, was it equivalent to cheating by either or both of the players? Q. In stroke play, B's ball lies just off the putting green. A's ball lies near the hole in a position to serve as a backstop for B's ball. B requests A not to lift his ball. Is such a request proper? A. No. If A and B agree not to lift a ball that might assist B, both players are disqualified under Rule 22-1. 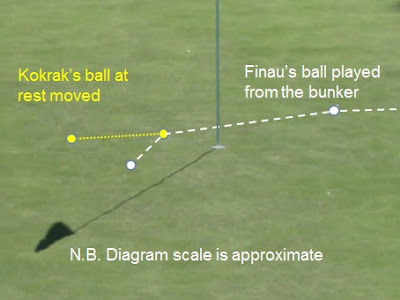 There has been a lot of comment in the golfing media about the Finau incident, with many reasoning that a player should be penalised if they purposely leave their ball on the putting green while another player is making their stroke from off the putting green, and/or the player making the stroke should always wait until any ball in the vicinity of the hole has been marked and lifted. My strongly held opinion is that there is absolutely no reason for any tinkering to the Rules of Golf in this regard. The number of times in a year that another ball provides an involuntary backstop to a player’s advantage is minimal and any attempt to account for these rare occurrences would probably worsen the major problem facing golfers today, which is slow play. This year, the R&A introduced ‘Ready Golf’ at its amateur championships and this is a practice followed by an increasing number of Committees in Club competitions, in an attempt to get players to finish their 18 holes in under 4 hours, as used to be the norm. Also, the European Tour has just announced that shot clocks will be used on every hole at the 2018 Shot Clock Masters, in Austria. Several of the proposed, modernised Rules for January 2019 are an attempt to speed up play, such as the option of leaving the flagstick in the hole when putting. It would be detrimental to introduce a Rule requiring players making strokes from off the putting green to wait while balls in the vicinity of the hole are being marked and lifted. If such a Rule were to be introduced in an attempt to prevent ‘backstops’ on the putting green when would it apply? For strokes made from the apron; 10 yards away, 30 yards, 50 yards? How close to the hole must the ball at rest be; within 1 yard, 2 yards, 5 yards? Who is going to measure and with what? It is totally unnecessary and practically unworkable! Some pundits are suggesting that because of the above difficulties in effectively implementing such a Rule any change in respect of backstops should only apply to professionals, where the prize money won or lost by such rubs of the green may be substantial. I do not agree, in fact I am opposed to any bifurcation of the Rules. Golf is almost unique in that the R&A / USGA Rules of Golf, which were unified in 1952, are the same for everyone who plays the game in competition, with the minor exception of Local Rules introduced to deal with local, abnormal conditions. Long may amateurs and professional golfers face the same consequences and challenges when they play, because it is one game with one set of rules for everybody, with player’s earned handicaps allowing them to play competitively with others who may have more or less ability at the game. Note: I answered some other questions on using a ball as a backstop, e.g. in match play, in this earlier blog. Another instance of Rules being wrongly blamed occurred last week at the KB Financial Star Championship at Black Stone Golf Club, in Incheon South Korea. Two players were penalised when it was realised that they had marked and lifted their balls, thinking that they were on the putting green, when in fact they were on the apron of the green. One of them, Hye-Jin Choi, was a co-leader of the tournament before the penalty was assessed. Then it was discovered that four other players had done that same thing, but had already signed and returned their score cards. The situation escalated when some competitors threatened to withdraw if the penalties were removed, while others said they would do the same if the penalties were enforced. There is no doubting that this was a bizarre shambles, but it had nothing to do with inadequacies, or unnecessary complications, in the Rules of Golf. Perhaps the competition Committee were to blame, or the on-course officials, or the greenkeepers, or the Korean LPGA, or the players, or their caddies, but definitely not the Rules! The KPLGA resolved the impasse by deciding to void the first round, wiping out all players’ scores. If you have any questions on the Rules of Golf, try entering a simple search term in the 'Search This Blog' box on the right side of any of my blog pages. Thanks as always for your highly informative blog. With regards to the backstop discussion, while I understand and agree with everything you say in terms of the rules, the only remaining issue I have is where the leaving of a ball as a backstop is effectively a nod and a wink to player assistance. Nothing may be spoken (in accordance with the rules), but even in a situation where a competitor is at his or her ball on the green (and to therefore mark and lift would take very little time) there is effectively a mutual understanding that the ball will be left unmarked, for no other reason than it could possibly assist the fellow competitor. This is also in the knowledge that the favour would always be returned in a typical golf club. Now, if I was to step in and insist on mark and lift (as I believe I am entitled to do under the rules), I would be viewed as breaking the omerta that exists. This is the difficulty, as you have said, it's not breaking any rules, practically impossible to create a specific rule for and intent is unprovable. But you know it is happening, especially when the player is already at or very close to his or her ball on the green. You have answered your own question. If you suspect that a fellow competitor is leaving their ball as a backstop to favour another fellow competitor, you may ask them to lift it before the stroke is made, Rule 22-1b. Personally, I would not bother, as there are enough bad breaks in golf that more than compensate for the very occasional good break that may occur when a ball is left on the putting green in this circumstance. I do go out of my way to try and prevent any breach of a Rule being made, but I do not prevent a player from using the Rules to their advantage. Barry, the rule and the decision make it plain that an agreement to leave a ball as an advantage for a fellow competitor results in disqualification of both players. I am unclear whether there is a penalty for asking or suggesting such an action if it is not then agreed. If I ask you to leave your ball as a backstop and you refuse am I to be disqualified? Similarly if you offer to leave your ball? Or are we simply to be educated regarding the rule? If a player asks another to leave a ball in a position where it may act as a backstop, the other player should immediately make it clear that they are going to mark and lift the ball. If this happens there is no penalty to either player, as there has been no 'agreement' to breach a Rule. However, if the question is asked and the other player makes no attempt to remove the ball then there is a tacit agreement and the disqualification penalty applies as soon as the stroke is made, whether or not the ball being played collides with the 'backstop' ball. Similarly if a player offers to leave their ball on the green in a position where it may assist, the player making the stroke should insist that it is marked and lifted bfore they make their stroke.